No Time to Cook: Hummus! | Delicious! Delicious! 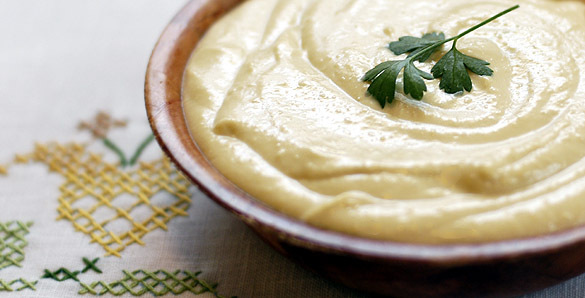 No Time to Cook: Hummus! A truly gorgeous evening in the mountains. Caryn sits on the steps, thumbing through a local paper. Amelia strolls up from a trailer down the row. I see you made it to Utah. Why is a Civil War movie shooting here anyway? They needed to simulate the Smokies. When Hollywood thinks of mountains, they think of Sundance. It’s the closest to nature they get. Caryn laughs as the door opens and Mr. R. appears with a napkin tucked in his shirt collar. Are we back from dinner? Amelia gives him her most flirtatious smile. Mr. R. nods and goes back inside. Amelia immediately returns to her normal professional self. After we wrap, some of the other assistants are coming to my room to hang out. Can you make it this time? Caryn inadvertently checks the door behind her before responding. Um, I guess so. I mean, sure. Can I bring anything? Maybe just some dip or something. I make a pretty good hummus. Oh please, no. Just pick up something at the store. Who has time to cook? She laughs at the thought and starts down the row again. Caryn waves goodbye before going in to assess the damage from dinner. Caryn tiptoes down the hall carrying a large bowl that has been practically licked clean of the hummus that was in it. When she gets to her door, she unsticks a note taped to it. She carefully replaces the note back on the door and slips inside without a sound. Ohh, drama! Was he miffed for professional reasons, or for personal ones? I can’t wait for the next tasty installment! I knew he would be looking for her. It never fails. Wait on a man and they could care less, leave and they want you! Sheesh! Probably wanted her opinion on which color tie to wear. Richard, black beans sounds gooooood. This is a really basic recipe that you can add a whole bunch of stuff to…sundried tomatoes, basil, whatever!